In early June this year, there was an item in the news about crowd-funding to raise money to develop a font for computers. The font was based on the handwriting of Albert Einstein. The hard work had been done, but the designers wanted to add variations to letters so that it looks more like someone’s handwriting where letters do vary, such as different forms for the letters s and f.
This item was picked up in a number of news outlets and it did seem rather exciting for a scientist to be able write an academic paper about relativity, say, in a typeface that resembled Einstein’s own writing style. 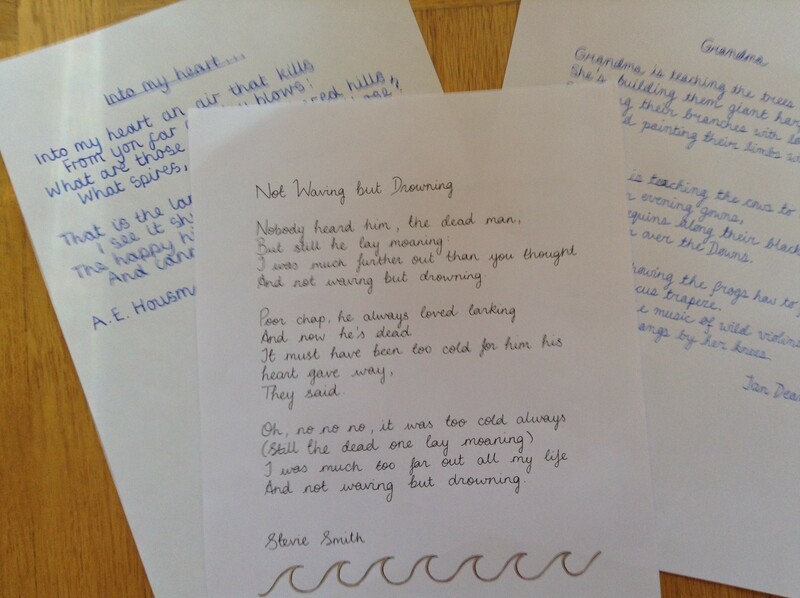 It might not be that surprising to appreciate that, as Chief Judge of the National Schools’ Handwriting Competition, I found this both interesting and sad. How much better to use traditional styles of letter-forms for formal printed or digital work (Times Roman, Helvetica, Cambria, or my own favourite – Hermann Zapf’s Palatino) which have been developed so that they are easy to read and read quickly both on screen and in print, and then your own handwriting for anything that needs to be hand-written. The advantages of handwriting are well rehearsed, but the fact that they increase business is perhaps not fully appreciated. A company producing development kits in the US started to hand-write personal messages on the backs of the envelopes before posting them. They timed the process and it took about 57 seconds to do this and a few simple drawings were added too. The effect on their business and the engagement of customers was huge. 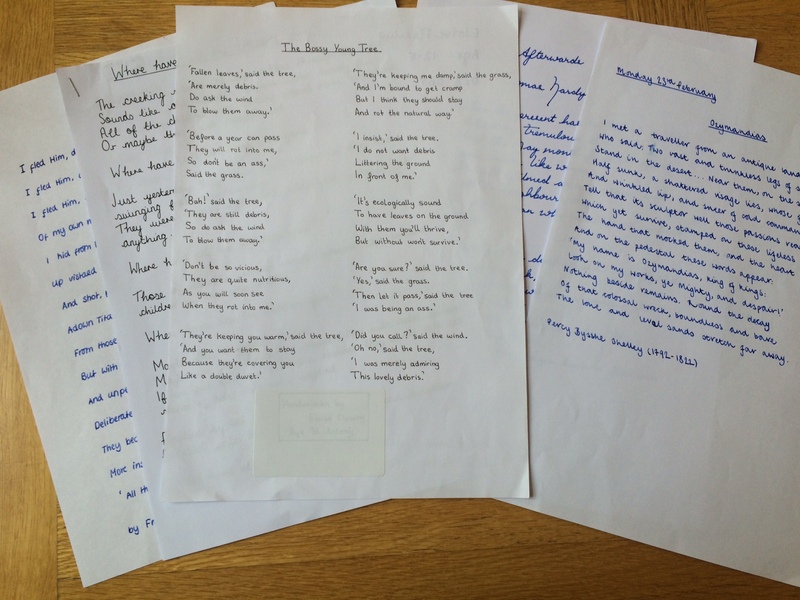 Photographs of the envelopes were tweeted, and customers talked about what they were using the product for – this in turn increased awareness of the product and sales. 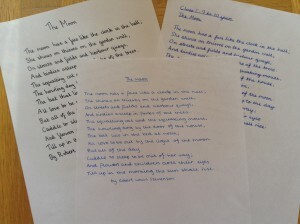 Handwriting proves its worth yet again! More details here. 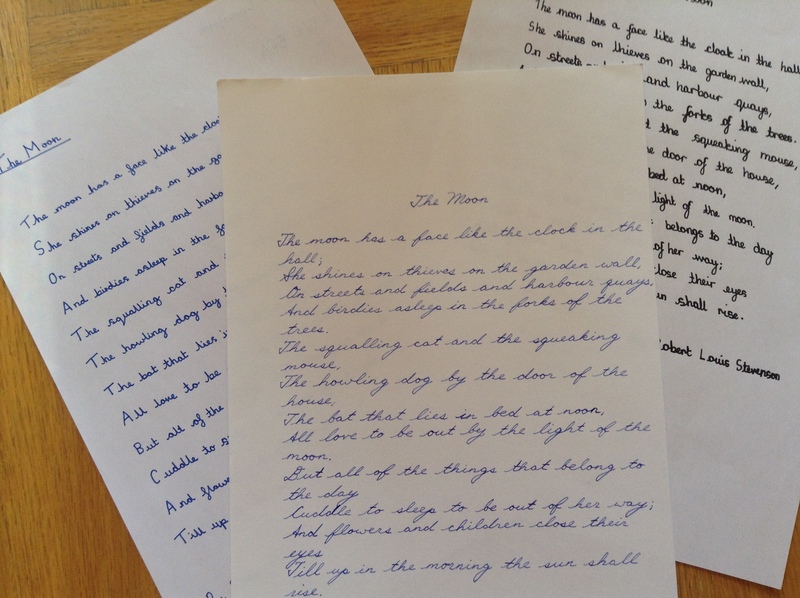 Handwriting, since September 2014, is now in the National Curriculum, and children are being taught how to hold a pen or pencil, how to form letters and how to join letters; spacing between words is also included. 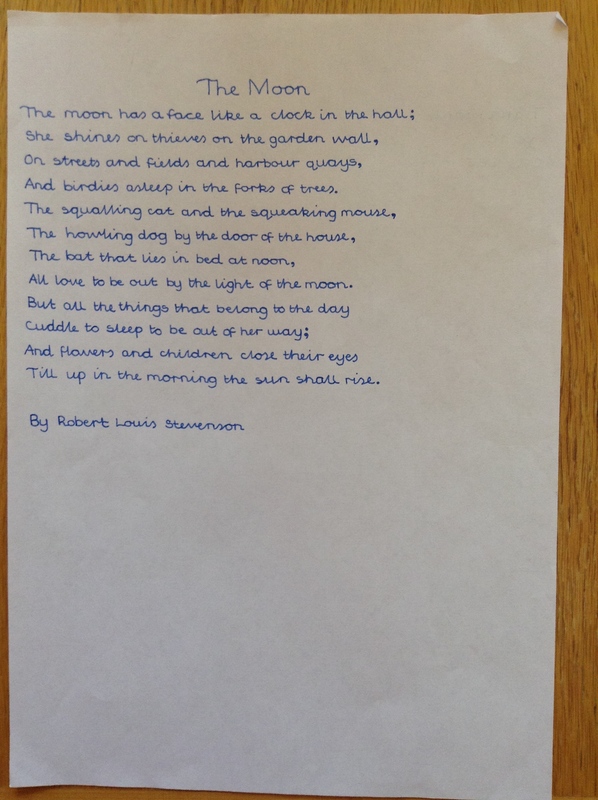 Good teaching of handwriting, though, is apparent from the entries to the National Schools Handwriting Competition. Almost 7,500 entries were sent in and the first sift this year was done at Cambridge University Press, the new sponsors of the competition. On the right is the winner of the six year-olds and under. The winner was six years-old. This year there were more entries for those aged four and under than previously, and teachers are to be commended for enabling young children to hold a pencil, concentrate, and form good letters for the length of time it takes to write out the poem. In each instance the pictures of the finalists show the winning entry on the top centre. 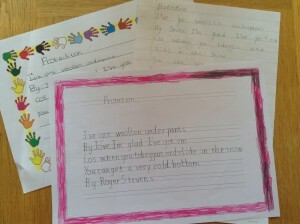 The five year-olds entries were good too, some schools using parallel lines to ensure consistency of letter height. The winner’s entry showed very good letter-formation, and I liked the variety of forms of the letter ‘y’. By six years-old some children are joining their letters, as demonstrated by the winner in this age group. 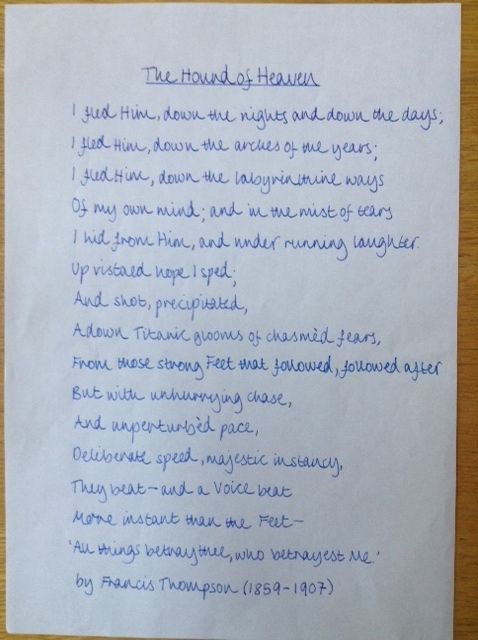 This was not the reason for winning, but here the clear letter-formation, rhythm and flow of the writing stood out. 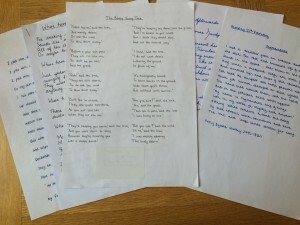 By seven years old, many entries showed joined writing and writing in ink, and this was the case with the winner and some of the highly commended entries. 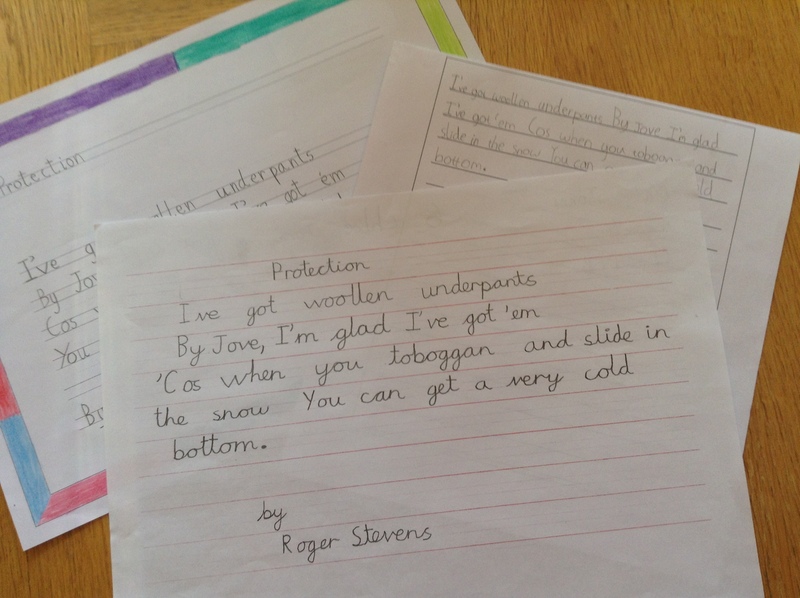 The placing of the poem on the page of the winning entry was very pleasing. 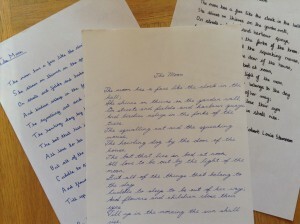 By eight years old, the writing in all entries was joined up and showing the beginnings of personal style. I particularly liked the unusual placing of the lines of the entry that was third, shown on the left in the photograph, where the shape of the poem is rather like a ziggurat; I thought that rather clever. Winner for seven and eight year-olds. 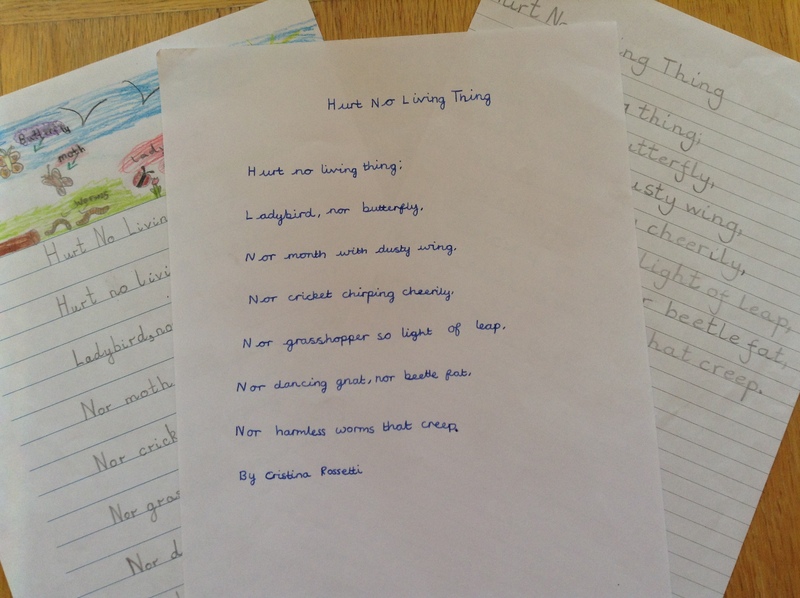 The winning entry for these two classes was very difficult to choose as there were many really good examples of handwriting. In the end the well-formed letters, good joins, clarity and consistency, and rhythm and flow of the handwriting all indicated that it was a worthy winner. 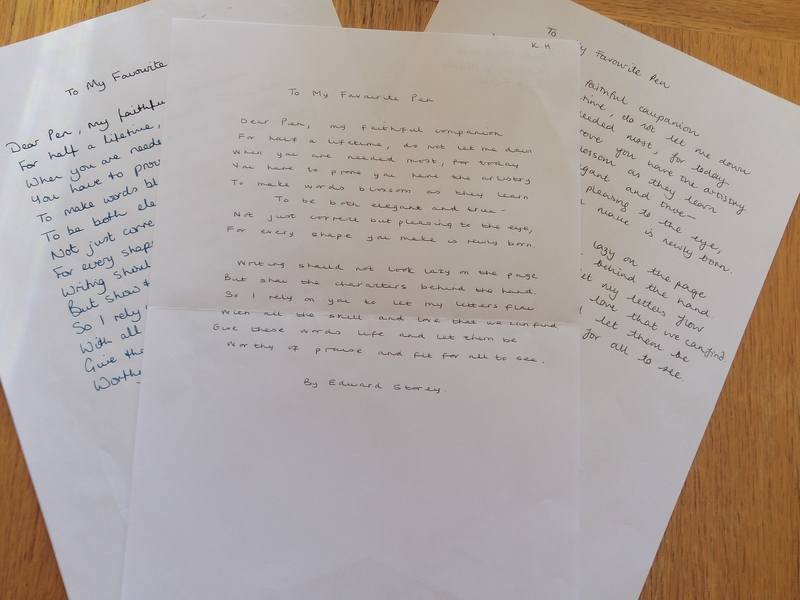 Individuality and personal style is well-shown in the handwriting for the entries at nine years-old. 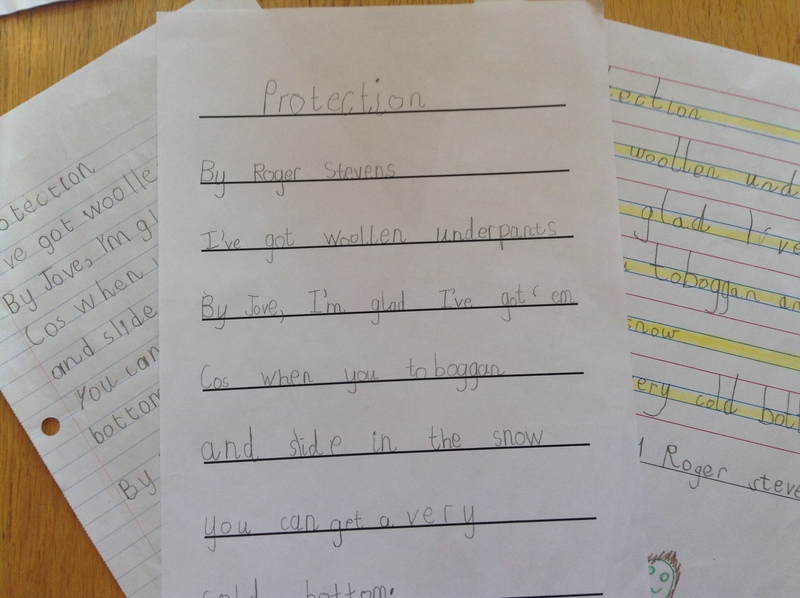 The winner shows a very mature writing style and a clarity that many of us would like to have in our own writing! It was difficult to choose winners and finalists in this age group, too. The winner of the next age group, those who are ten years-old, shows very clearly that writing which slopes backwards is not anathema that it used to be. There is a real flow to this writing and it is extremely clear to read with well-formed letters. There was a slight backwards slant to the Overall Winner for these two age-groups as well, the Class C winner, but the letters are beautifully formed, the writing clear and it shows a good rhythm and flow. 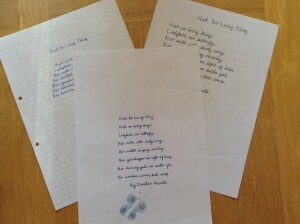 From age eleven onwards, children can choose their own poem, and it is sometimes difficult to concentrate on the writing rather than spending a lot of time reading personal choices of poetry or even poems written by the hand-writers themselves! 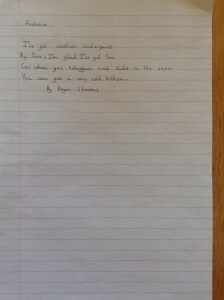 The problem of personal choice, and in which it would be very helpful for teachers to advise, is that poems should be of a reasonable length to allow for the writer to get into a rhythm of writing, but not so long that the poem does not fit well on one side of A4 and may even have to go on to a second sheet. Occasionally, the prescribed poem choice in the previous Class is written out, and this is perfectly acceptable, as the case with the eleven years-old winner. 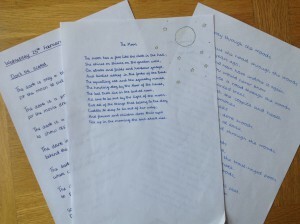 The winner of the twelve years-old group coped well with a long poem, which fortunately had short lines. The writing is particularly clear although the writer may well need to join the letters to speed up. There is more individual style in the writing in the age thirteen years group, as would be expected, although far fewer entries in this age group. The overall winner for CLAS D shows a great deal of individuality and character at age 12 and stood out as the winner for these age groups. 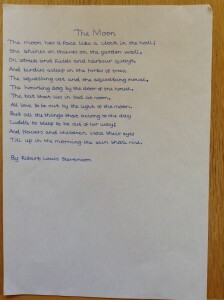 And entering for a handwriting competition as an adult – and all staff in a school can enter – not just the teachers, gives a very strong message to children that handwriting matters whatever age you are. As expected there were some very individual styles here and choosing between them was not an easy task, so congratulations are due to the winner and finalists. 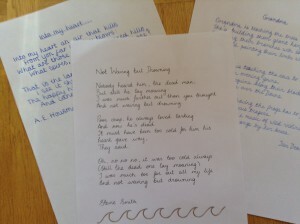 So what can schools and teachers do to ensure that their pupils are in the finalists of the handwriting competition? 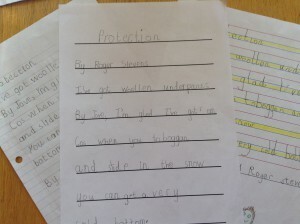 Apart from teaching handwriting well, which goes without saying, encouragement is so very significant. 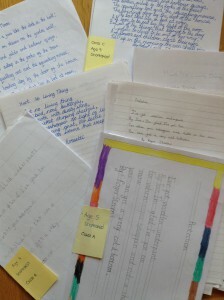 It is also important to emphasise how important handwriting is throughout life, and so as teachers, entering the competition themselves, and including all those working in the school to do this ­– Teaching Assistants, Lunch Time Ancillaries, Kitchen Staff, Caretakers, volunteers who listen to children reading, even, as we had one year, the school’s Father Christmas, all will show that, no matter how good, or bad, their handwriting is, it is still important to hand-write as an adult. All the physical aspects of handwriting should, of course, also be allowed for – height of table and chair being conducive to sitting for a period of time and not cause pain or discomfort, appropriately-sized pen or pencil – not too large or small – and with a triangular grip if that helps. 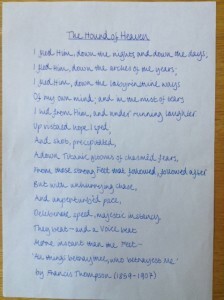 Assistance with placing the poem on the page is also a good idea, not too far to the left and further down the page if the poem has few lines. Before the writing starts, children should be reminded that, unlike the normal process in a classroom, their names do not go on the front of the sheet of paper, but on the back. And when the writing has been completed, the schools should ensure that the correct name – first name and surname – as well as the child’s age is written on the back of the paper. The school’s postcode is essential, and this year, a couple of children missed winning an age group because there was no postcode and no surname. Children are identified by postcode and first and surnames and with almost 7,500 entries it is impossible to go through all the lists of entries from schools to find a ‘Thea’ or ‘Joseph’ with nothing else to go on but the name of their school house. It was a particularly successful year this year and with very worthy winners. Congratulations to all the successful children, the schools they go to and the hard work teachers have put in to ensure that success. 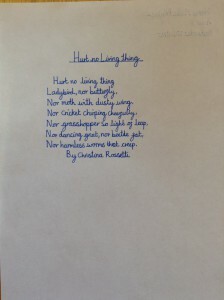 This entry was posted in Blog, Handwriting and tagged Cambridge University Press, children's handwriting, handwriting, National Schools Handwriting Competition on 15 July 2015 by Patricia.